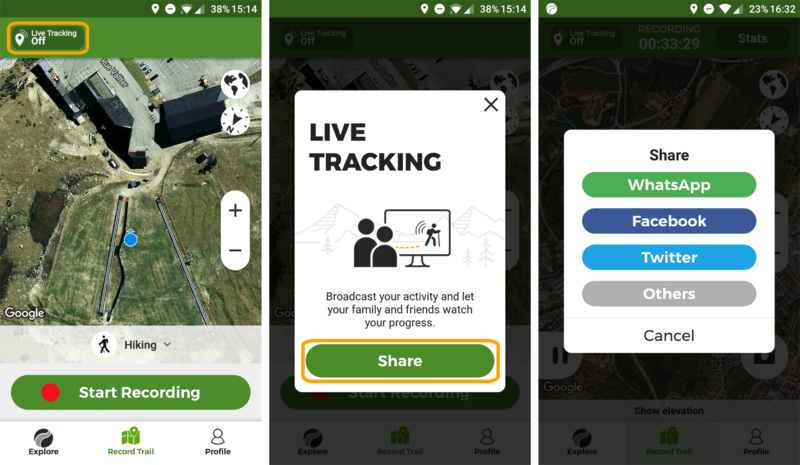 Are you following a track on your own or doing a race, and want your friends and family to see in real time where you are? Now, who you decide can see where you are at all times while you record a trail. Click on the "Live tracking" button that you will find in the upper left corner of the "Record Trail" screen. If you were not yet recording a route, you will start to record it. Others: Instagram direct message, Facebook Messenger, email, notes, SMS, Bluetooth, etc. Anybody with this link will be able to open it. A map will open from a browser and will show your current position and all the track you have made so far. In case you are following a trail, your followers will also see the full track (including the missing piece).